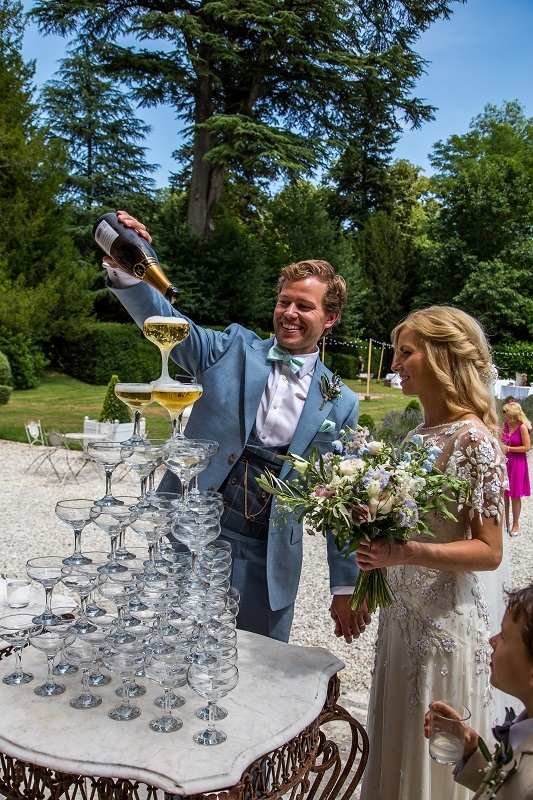 What made you decide to get married at Chateau la Durantie? 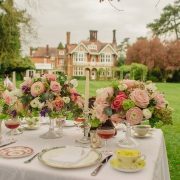 We dreamed of an al fresco wedding amongst wildflowers and overhanging trees, somewhere we didn’t have to put up too many decorations, so the natural landscape would be able to speak for itself. 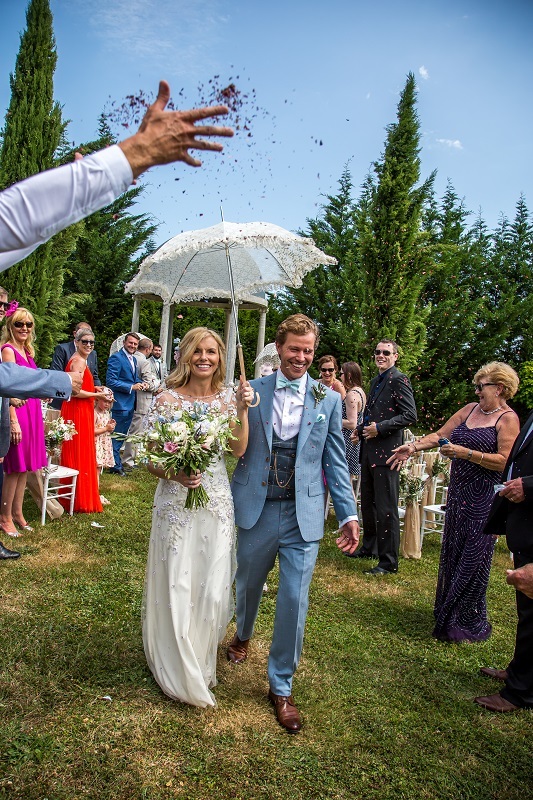 We found lots of beautiful venues in the Cotswolds and in Wales where I am originally from, but we didn’t think our British summertime would allow us to be outdoors all day and night so we thought we would look in France as well and see which came out on top. 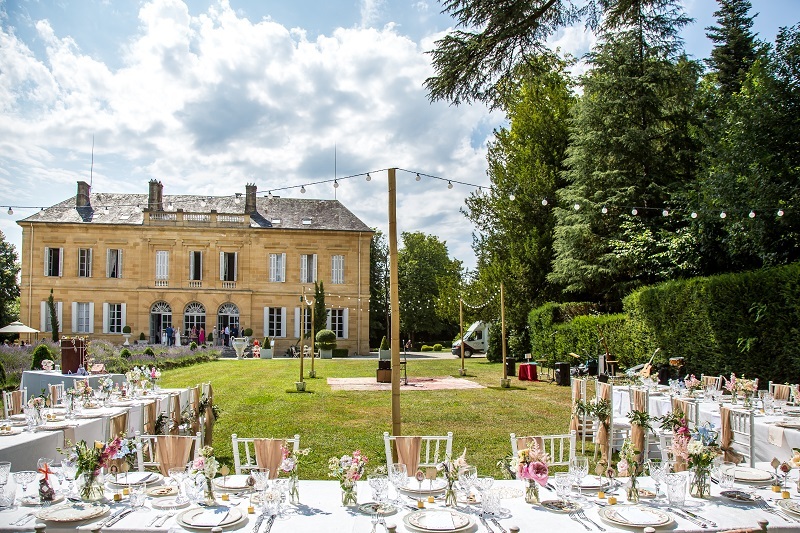 We’ve always loved France for the outdoor culture, food & wine and gorgeous rolling countryside, so we researched the best French wedding venues and Chateau la Durantie came up as the first place we found, and it ticked all the boxes. 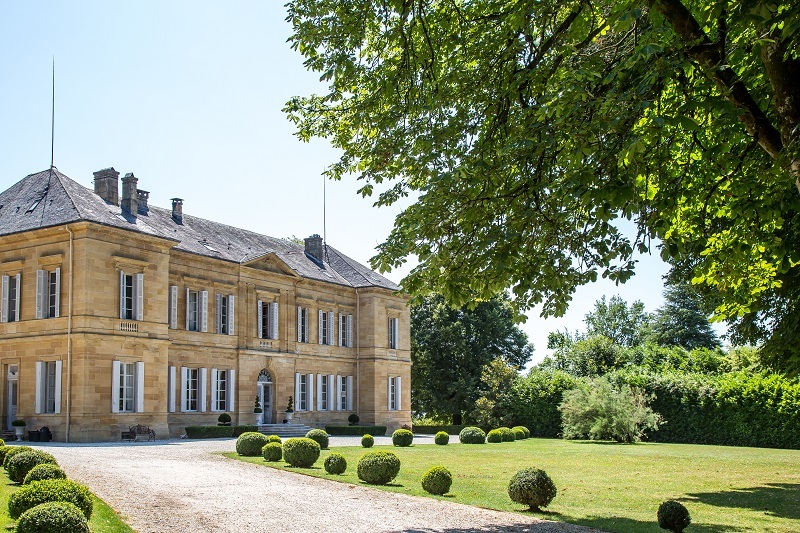 We made a shortlist of 6 places in total, booked a long weekend and went on a mini tour around a number of regions visiting a range of different Chateaux. Chateau la Durantie was last on our list to visit and as soon as we drove through the gates, it just blew us away. It was perfect! The façade was so impressive but not too imposing and inside was so light and elegant with beautiful vintage touches in every single room, which I just adored. 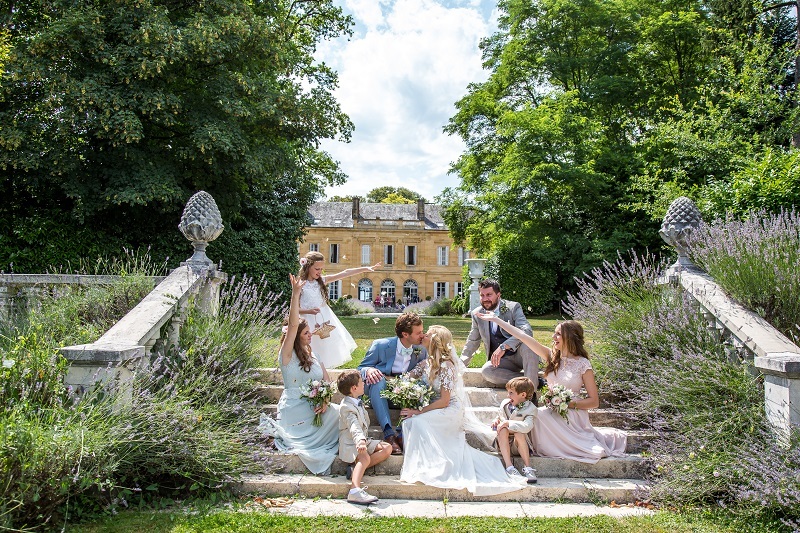 The grounds were stunning with a long gravelled walkway bordered by wild lavender, which acted as an aisle leading to a stone cupola at the bottom of rolling gardens. It was the perfect centrepiece for our ceremony and to top it off, it had a wildflower meadow next to the Cupola for perfect picture opportunities, in fitting with our original vision. The owners Victoria and Ralph live there so even though it looked like something out of a glossy magazine, it still felt like quite homely. They were both so lovely and allowed us to have full reign to plan whatever we wanted given the intimate numbers we had, so we snapped it up. 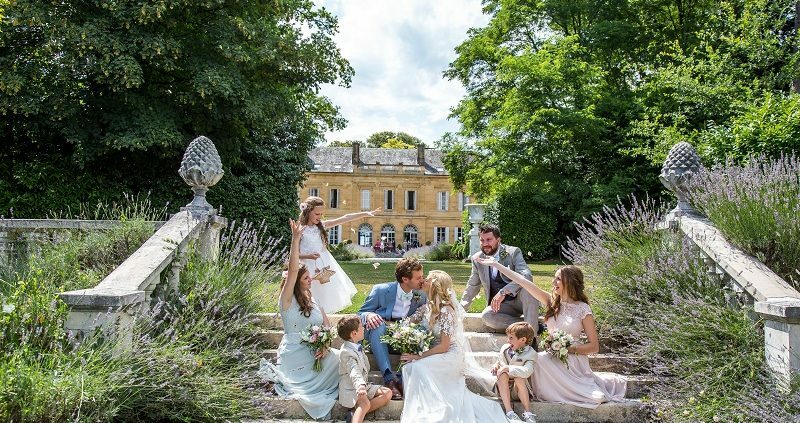 It was the perfect venue for our vintage chateau wedding. 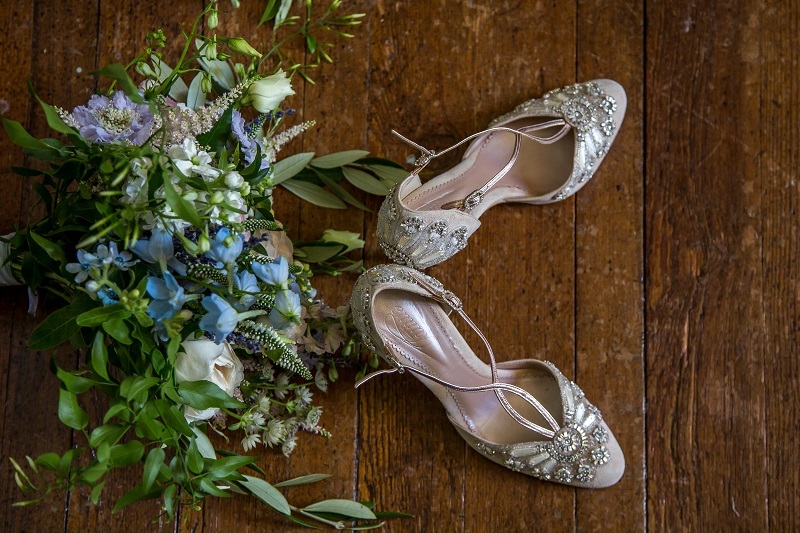 What were your main ‘must haves’ for your wedding day; any key suppliers? 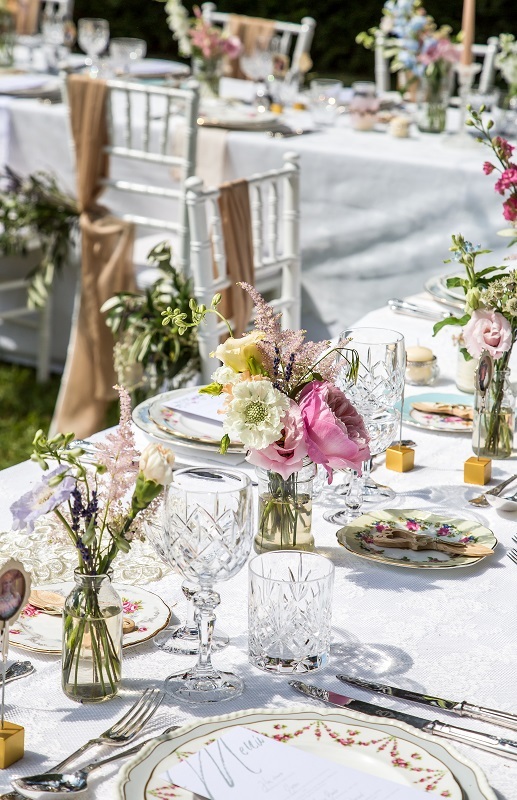 I really wanted Vintage touches, so the elegant vintage crockery and glass-wear was a must and I am so glad I found Vintage Flair, which was recommended to us by our wedding stylist, Helaina Storey. 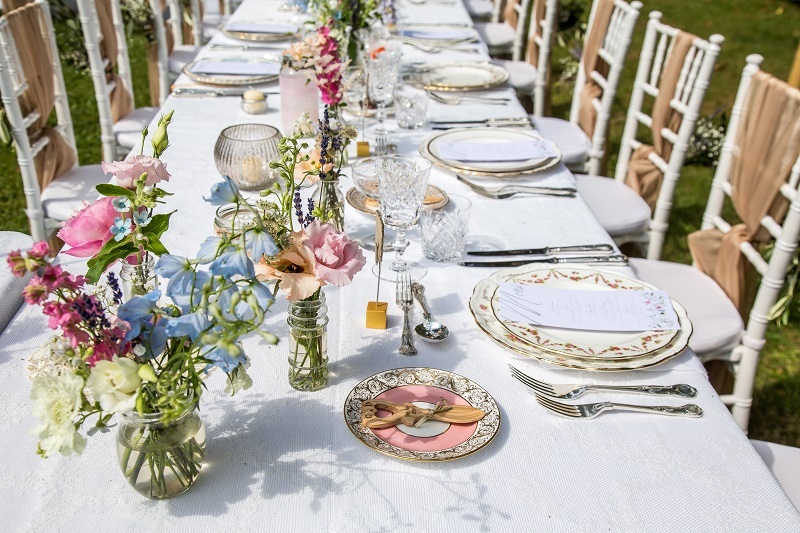 I was keen to incorporate my late Great Grandmother’s vintage lace parasol and David used his Great Aunt’s 1920’s suitcase to make the table plan. 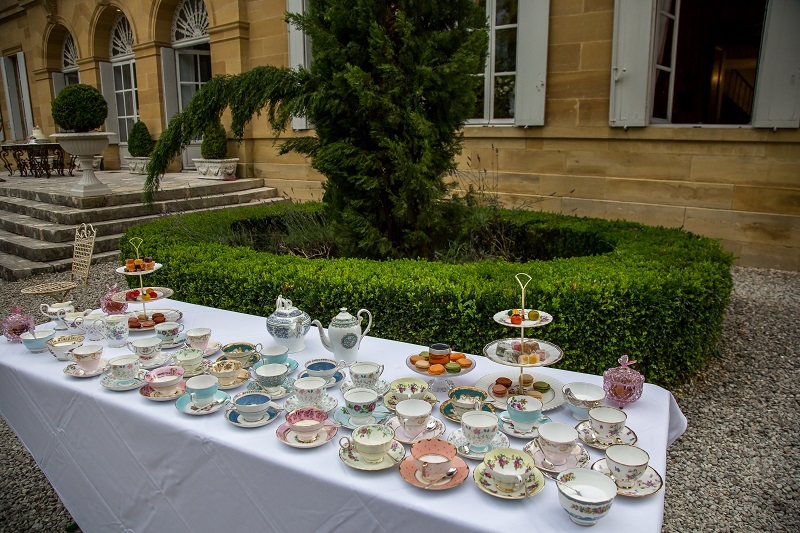 We also wanted to keep many of the suppliers as locals in France for the full French experience, which really paid off plus it took a lot of the stress out of things as many of them knew the area or each other, and some had supplied the Chateau previously. We were keen to create a relaxed ambience, so we planned the day around having lots of music. We scoured the internet for the perfect line up and found a local string quartet who we were keen to have for the ceremony and reception, and while we sat down for our meal, the lead singer of the band we had booked for the evening serenaded us before the rest of the band (the Rix’tet) came out and put on a fantastic performance for the evening. We danced under the stars with the Chateau in the background, it was just perfect. We were keen for the day to truly reflect us both, so we incorporated lots of little personal hand made touches; This included some hints of my Welsh heritage with carved Welsh love spoons for the favours; We hand made small portraits of each of our guests for the place settings from our personal supply of pictures; We hand wrote a vintage mirror with our cocktail menu; Dave made a gin bar from some old wood, upon which we placed the home infused Gin that we made. We hand wrote the gin labels and had a wax seal stamp made with our initials on, which we originally bought for the invitation suites, and put them on the bottles so it looked like our own brand of Gin. It was really worthwhile as it all came together so beautifully. 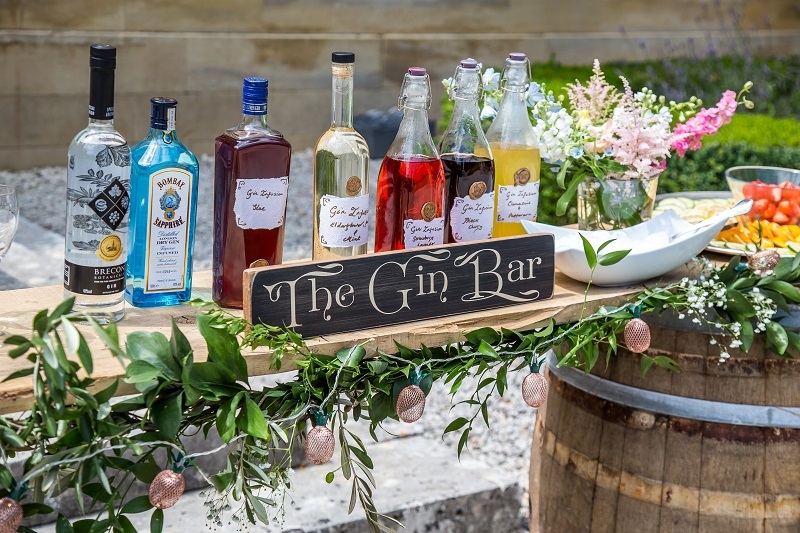 All of our guests and even some of the suppliers commented on how it was the best wedding they had ever been to, and the little touches made it that extra special. Who did you wear – dress/ shoes etc? 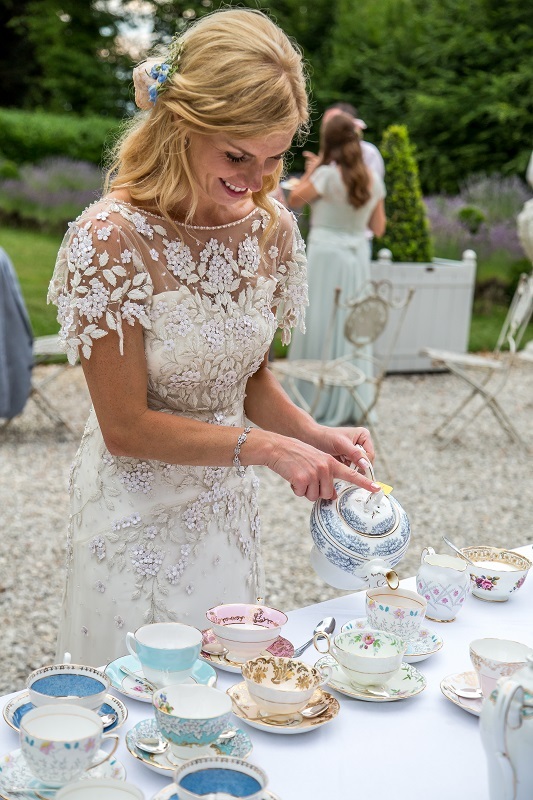 I had my heart set on a Jenny Packham dress as I love how her designs are inspired by the 1920/30’s so they fall naturally with no internal structure, and the details are just stunning. I chose ‘Apache’ from the 2017 collection as I wanted something light, floaty and feminine with embroidery. I worked with the dressmaker at the boutique (Pantiles Bride in Tunbridge Wells) to redesign the sleeves as they were originally full length, and they did a fantastic job and really cared about the smallest detail. The end result was stunning and it was really special to know that my dress was one of a kind with my own personal stamp on it. My veil was a bespoke design from Britten Weddings and my garter was from their sister company the Wedding Garter Co. I went for a ‘barely there’ silk style tulle called Ilona with an ivory pencil edge, and my Mum hand stitched some of the embroidered vines and flowers to the edges which were taken from the spare pieces cut from my dress. My mum also made a little headband for my daughter from the dress flowers My shoes were from Emmy London, vintage inspired. My bridesmaids also wore Jenny Packham from her No 1 collection each in different shades to match their personal preference. 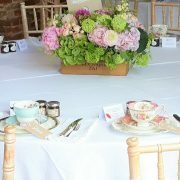 I was in awe of everything on the day and seeing all our hard work on the meticulous planning and attention to detail come together made me so happy, but in particular I loved waking up to glorious sunshine on the day; Having my florist deliver the flowers and how their beautiful scent filled the room; Seeing my Dad burst into tears when he walked into the room and saw me for the first time; Seeing my little girl and my niece in their flower girl dresses and how proud my niece was to hold my veil as we walked down the aisle. Seeing David’s face when I joined him at the pergola and how emotional he and everyone were during our personal vows; Being serenaded by the violinist who came out to sit with me as I sat for a few moments to admire the string quartet playing; The drone shot with the whole wedding party waving while we stood in the upper storey windows of the Chateau. I felt like a genuine Royal bride! (My married name is Royal). Not to mention all the lovely comments we received throughout the day about the little details. It was lovely that they were not only noticed but really appreciated. 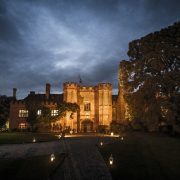 Any advice you would offer those currently planning a wedding? Try and add as many personal touches as you can, these are the things that stand out in people’s memories after the event, plus it saves on cost! If your budget can stretch to it, hire someone to coordinate and style the day. We didn’t have a full wedding planning service as we wanted to find the suppliers ourselves and make a lot of our own things, and it was lots of fun to do, but we definitely wanted to relax and enjoy the day rather than stress about setting up. We hired Helaina Storey who was fantastic, she took all the stress out of the day for us, and paid attention to the little details to make our vision come to life. Stay true to what you want and don’t be too heavily influenced by other people; it all comes together beautifully if you stick to your vision. 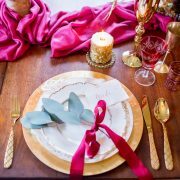 Use suppliers that pay attention to what you want and care about making it a special day for you. Don’t feel pressured to spend a fortune on stationery or signage; Hand written or handmade touches make it extra special and is so much fun to do. 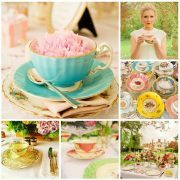 I used some very talented designers on Etsy to source some really lovely designs for the invites, menus etc. 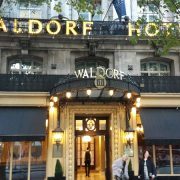 and had them professionally printed locally, and then I sourced and made the finishing touches myself such as a wax seal stamp with our initials, ribbon, vellum paper and elegant envelopes to make the suites. I also used some of my more creative guests to write on mirrors for the gin cocktail menu and make little door signs for the rooms with slate heart chalkboards, which looked really lovely and gave people a little part in the day. I also sourced a bundle of silk and chiffon scarfs for the chair backs, which I teamed with some florals from my florist, rather than spend a fortune on chair covers. They looked so much nicer than chair covers in my opinion. Most importantly, take time to cherish the little moments throughout the day. Appreciate others enjoying what you have created and celebrate what the day is really about. Love!